The Edwards 5533M Adaptatone Signal is an explosionproof, heavy-duty industrial, tone-selectable, signaling device capable of producing volume-controlled, high-decibel tones. The signal accepts up to two contact closures and delivers two audible output signals selected from the 55 tones available. The two tones may be selected by setting miniature switches within the unit. One of the tones can be assigned a priority status to override the other tone. For more information on priority tone operation and a complete listing of all 55 tones, see Tone Selection and Priority Operation listed under catalog pages on the left hand side of this page. The 5533M Adaptatone mounts on any surface using three bolts. See Adaptatone Signaling Installation under the catalog pages on the left. 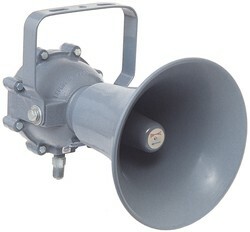 For use where a high decibel sound is required for alert or evacuation in hazardous locations. Typical applications include signaling use in mining, granaries, flour mills, tankers, refineries, laboratories, spray booths, and other hazardous locations.